Hi there! We are Jack, Ben, and Hugo, three tuxedo brothers living in Boston! Yes, we are all named after characters from our mum and dad’s favorite TV show, LOST. You might know us from Instagram, Facebook, Twitter, or Tumblr (@tuxedotrio). We blog about city living and cat products we love. Our mum started this blog way back in 2011 when she was training Ben and Desmond to use the toilet. If you’re interested in reading about how she did it, you can go back to read our early blog posts from start to finish. My name is Ben! I was born on August 23, 2011, along with my brother Desmond. If my dad is home, you will usually find me on the couch with him. He is my favorite because he sings and talks to me all the time. I like to climb things, especially the back of doors, so my mum put shelves up above some of the doors in our house. I am also the only one out of the three of us who still uses the toilet. I guess you could say I’m the smart one! My name is Desmond! I was born on August 23, 2011, along with my brother Ben. I am a little less outgoing than my two brothers, and normally I just like to be left alone. I do like to snuggle sometimes, but only on my terms. I’m also a picky eater and usually my two brothers get to my dinner before I really have a chance to decide if I want to eat it. Sadly, our beloved Desmond passed away suddenly on May 3, 2014, due to a previously undetected heart condition. We had almost three happy years with Desmond and though he was taken from us way too soon, we are thankful for the time we had with him. RIP, Desmond. See you in another life. My name is Jack! I was born on March 10, 2013 and when my mum saw a picture of me, she knew she had to adopt me. I came from the same mum as Ben and Desmond! I like to play fetch with my favorite toy and I especially like snuggling with my mum under the covers at night. She calls me her baby, even though I’m the middle child now, and I am ok with that! My name is Hugo! I was born on March 26, 2014. My mum was so sad after Desmond died, she immediately began looking for a new baby. She found me not long after and I’m so happy she did! I like to talk a LOT and I am best buddies with my new brothers, Jack and Ben. I like to keep my big brothers on their toes. What beautiful babies!!! 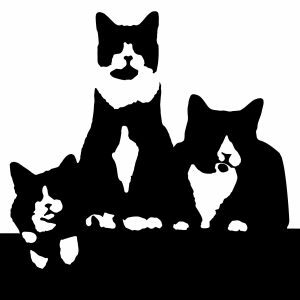 We have 3 Tuxedo cats (JeeJee, James Bond, and Winnie) and love them madly. Tuxedos are (in my experience) exceptionally smart and sweet. Hug these cuties for me!